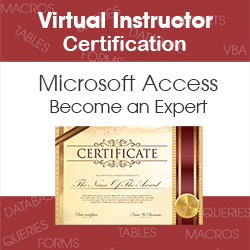 This certification program contains 31 video courses. These videos contain the same information covered in our LIVE, online, 1-hour, instructor-led classes. You will also be able to download the training guide along with any class files that are used in the video course. We realize that questions may occur while you are watching a video course. You can submit a question and we'll answer you with either a written answer, a video answer, or a phone call. During the PreLaunch, each week, we'll add one to three new videos starting with Series 100. At the end of each series, you'll have a review test requiring a score of 80% or higher before you can continue to the next series. You'll receive a badge each time you complete a series and a final certificate badge when you complete the certification. We'll also mail you a Certificate of Certification. Once you've completed all the lessons in all five series, you'll have a final test that also requires a passing score of 80% or higher. You will also need to submit a final project that tests your knowledge of the various topics covered in the Access Certification program. You'll need a passing score of 80% or higher on the project as well in order to receive your Virtual Instructor Access Certification. Click the series titles below to display video course outlines. You'll be able to apply the concepts covered in this class to most database table designs. You'll also learn how to use the Query Wizard to create a query that finds duplicate or unmatched data. Also explore the difference between using the Datasheet View button and the Run button. SQL is used by most database programs and Access is no exception. You'll learn the pros and cons of each method. The tables used in this class are the same tables that were created in Access 104: Create Tables for a Contacts Database. The tables used in this class are the same tables that were created in Access 105: Create Tables for a Customer Database. This hour demonstrates how to edit macros you've created using the Control Wizard. It introduces you to the Macro Editor program within Microsoft Access. You'll learn how to add folders containing Access database to the Access Trust Center so that when you open a trusted database you will no longer see the prompt asking you if the database is trusted. In Part 2 of Report Layout View, you'll learn additional formatting commands that allow you to customize the look of your reports created using the Layout View. This segment of Report Design View shows you how to add fields, groups, and sorts to a report. You'll also learn why you cannot add calculated fields to page headers or footers. You'll learn how to allow specific fields to grow or shrink based on the data contained in the fields. In Report Design View Part 4, you'll see how you can create a Main report that contains sub-report(s). You'll learn how to display subtotals and totals within these reports.